I used to work in a hospital. I was a supervisor for housekeeping. So yeah, I was in charge of a staff that was tasked with keeping a 600+ bed "place full of sick people" clean. I've seen just about everything... and had to clean up after it. Skirmisher Publishing, with help from a practicing medical doctor, is now bringing some of the sicknesses I saw during my time at the hospital to your gaming table (not literally). 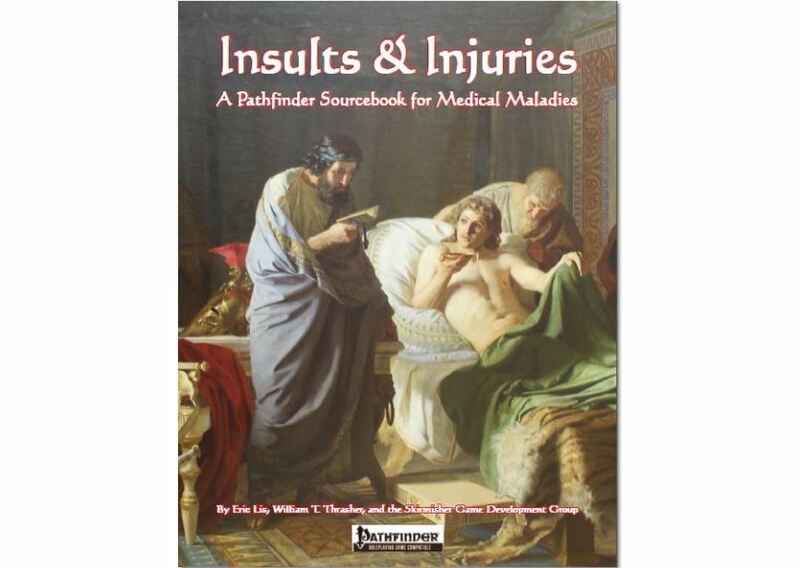 Insults & Injuries takes real-life medical conditions and turns that into stats and conditions for your Pathfinder games. This is no small "your strength goes down when you're kinda sick" sort of thing, either. This book has an introduction, fourteen chapters, and six appendices. There are over 50 diseases described (and how they effect your character and how they can be treated). There's a chapter on drugs, alcohol, and poisons. There's another chapter on mental illnesses. There's rules for surgical procedures ("I'll just swing my sword at it!"). There are four new prestige classes for healing-types (both magical and mundane). There's new spells, equipment, and feats. There's even rules for how these afflictions might affect other races like Drow, Dwarves, and Giants. Turn the page, wash your hands. And then you turn the page, and then you wash your hands. You can pick up your copy now.